It is likely that you interact with ‘the cloud’ on various devices, multiple times throughout the day. However, for pharma we have only just scratched the surface regarding what the cloud can offer in terms of security, connectivity and efficacy. ‘Business analytics’ and ‘cloud’ are often misunderstood. 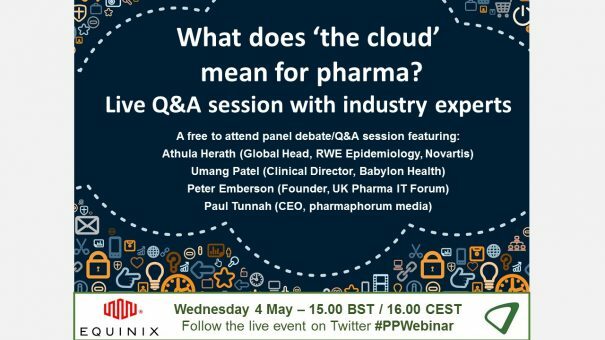 To answer this, pharmaphorum, in conjunction with industry stalwarts Equinix, present a unique Q&A event defining what the cloud actually is, offering the opportunity to ask any questions you may have around what the cloud can do, and how to remain compliant in utilising this technology. Patient outcomes – The cloud and patients, what are the routes to improving outcomes? Internet of things – As the ways to gather data and interact increase exponentially, how does the cloud support this? What are the opportunities and can we eliminate the risk? Data and security – How to achieve compliance almost automatically. Collaboration – Why and how the cloud enables true partnership working. The event originally took place on Wednesday 04 May 2016. Please click here or on the button above/below to view the on-demand webcast. Tim has 20+ years’ experience in the IT sector and is at the forefront of the Health Innovation Technology (HIT) ecosystem at Equinix. Equinix are at the centre of ‘interconnection’; the internet, cloud computing, network density and the next wave of being the internet of everything. So what does this mean for you? As a representative of Equinix, Tim is here to listen to your business needs; your challenges being faced today, as well as key strategic initiatives within Connect Health, and ultimately help move your business forward in the new digital economy. Athula has recently joined Novartis’s Centre of Excellence in Real World Evidence. Prior to that Athula worked for over 10 years as Statistical Director for Medimmune/AstraZeneca. He is a data and statistical scientist shaping and enabling pharmaceutical statistical organisations to design and statistically engineer pharmaceutical (clinical, epidemiological, translational, biomarker, research and discovery) development programmes. His specialties include design and analysis of (uncommon) clinical, observational and biomarker studies, statistical modelling/simulation of biomarkers (genetics, genomics, proteomics, metabolomics) for disease onset, progression, clinical effect and outcome. Umang is an NHS paediatrician, has served as a clinical fellow for the NHS Leadership Academy and is a trustee of Attend, the UK’s national charity for volunteers. Umang joined Babylon Health from Aviva, where he was Director of Clinical Transformation and responsible for a series of new initiatives in the model of healthcare delivery. Peter is an independent technology consultant across the health and pharma industries and founder of the UK Pharma IT Forum. With other IT leaders in the sector, the forum seeks to offer one of the first valuable and safe collaborative economies across life sciences IT. Peter also advises global pharma/life sciences/health companies on the future of technology, with a special interest in the role of pharma IT, integration into the NHS and ‘bigger’ data. Peter believes that without delivering the speed and value of SaaS and the cloud, life sciences IT will fail.